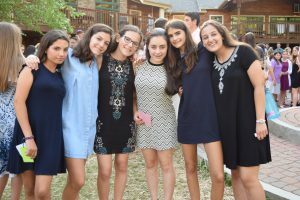 Almost every Yavneh camper and counselor will tell you that Shabbat is their favorite time at camp. Clearly, Shabbat at Yavneh is its own special breed. Starting late Friday afternoon, a different rhythm overtakes camp. It’s a beautiful rhythm! We take great care to find our most perfect outfit and neaten our hair. We ready our personal space. We snap pictures galore as we walk to Relish. We link our arms and sing our hearts out. We stroll to Gilboa still arm in arm. We find the right wooden bench and wistfully wish our friends a “Shabbat Shalom.” We hear the Acapella group, listen to a story and pray with kavannah and keva. We hug. We swiftly move to the Chadar Ochel as we ready ourselves for a scrumptious meal. We sing Shalom Alechim. We eat in multiple courses and leisurely finish up. We transition to t he Ben Tzvi. to sing spirited Z’mirot. We close our eyes taking in the sweet sounds of Friday night. We tisch. We go to sleep peacefully and wake up for more. We engage ourselves in prayer. We hear Kiddush, eat really good coffee cake and then gather together for Musaf. We laugh at the Parsha Players. We change our clothes to play basketball or hang with our friends. We eat some more. We play a game. We read a book. We catch up with a friend. We go for a walk. We are posed an interesting question. After Tzipori, we eat out final Shabbat meal and grab a few last melodies. We walk through a line of Kerem holding candles. We watch our friends perform. 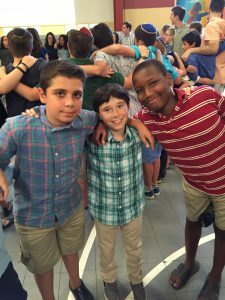 We sway to the groove for Havdalah and then dance our hearts out. We can’t wait for the next Shabbat. It’s a beautiful rhythm. While, we won’t be able to elicit all of these feelings, we hope that our Yavneh families will join us for our annual Yavneh Shabbat on Friday, November 11 at Hebrew College in Newton. Our promise is to bring a little bit of that Yavneh feeling to the autumn air.